Can’t escape the noise? Take an impromptu DXpedition via the KiwiSDR network! While I love the Panasonic RF-B65, the Voice of Greece and a St. Ambroise Oatmeal Stout: this combo can’t fight the persistent radio interference here at the condo. Some of you might recall that I’m spending the months of August and September in a condo near Québec City, Canada. We love it here, though it does present some radio challenges. Unlike our rural/remote mountain home in the States, I’ve always had to cope with QRM (manmade radio interference) here at the condo. Not surprising. I typically bring my PK Loop antenna–it helps lower the noise a tad and is easy to take out on our balcony for optimal reception. Lately, though, the QRM has been even worse on the balcony than inside the condo (more on that in a future post). Some North American and European stations punch through the noise when propagation is favorable (especially the Voice of Greece and Radio Romania International) but there have been evenings where nothing could penetrate the wall of noise. One way I escape the noise, of course, is to take my radio to a picturesque remote location for the afternoon or evening. It’s amazing the number of signals you can pull out of the ether when the noise floor is so low. Back at the condo, though, there’s no easy way to escape the noise. Perhaps 21st century problems require 21st century solutions. This year–especially here at the condo–I’ve spent a great deal of time exploring the KiwiSDR network. For those of you not familiar, the KiwiSDR is a self-hosted WebSDR which operates much like a mini U Twente WebSDR. KiwiSDR owners install their SDRs at home–or in other favorable locations–then share control of their SDR with the world via the the Internet. 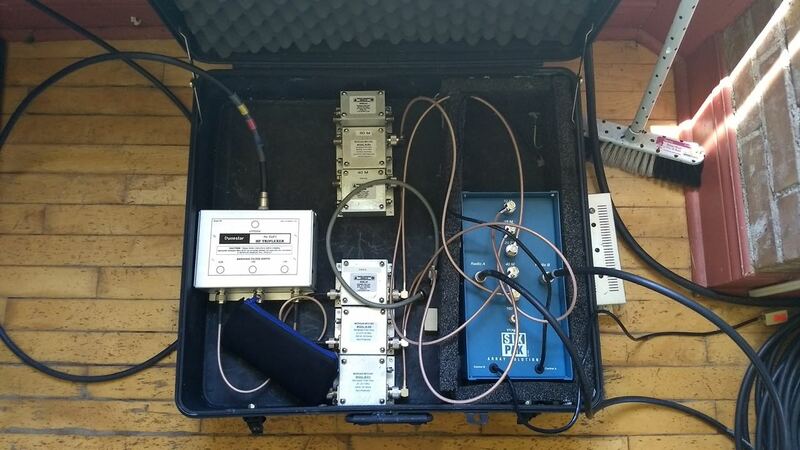 Like the U Twente WebSDR, KiwiSDRs allow multiple simultaneous users to control the SDR independently of each other. Each KiwiSDR can allow up to four simultaneous guests (the U Twente WebSDR can allow hundreds of simultaneous users, but it’s also a university-supported bespoke SDR with fantastic bandwidth!). Over the past few years, the KiwiSDR network has grown almost exponentially. There are Kiwi SDRs on every continent save Antarctica (someone remedy that, please!). Each red pin represents a KiwiSDR installation. Other than the fact that the SDR audio is piped through the Internet–and you can’t walk outside and adjust the antenna–there is no difference between using a KiwiSDR remotely or locally. In fact, the KiwiSDR only has a web browser-based application, there is no downloadable application for local use. So quite literally, the experience of controlling and using a KiwiSDR locally or globally is identical. And it’s so much fun! I browse the KiwiSDR network via the map above, select an interesting location, and virtually travel there for an impromptu DXpedition. I can travel to India, Italy, Japan, New Zealand, or Hawaii via the network and be back in time for dinner here in Canada without breaking a sweat or even using frequent flyer miles! I’ve found that the combo above makes for an immersive experience. I use Bose Quiet Comfort noise-cancelling headphones paired with my iPad Air (which I have enclosed in a Zagg Rugged Book). With a reasonable Internet connection, it truly feels like I’m there. Of course, you don’t need an iPad, or any special equipment. The KiwiSDR application works with pretty much any computer, tablet or smart phone that has a web browser. For the best experience, however, I would suggest connecting a good external speaker, bluetooth speaker or headphones. But I would argue that it is real radio! It’s a real radio, connected to a real antenna that you’re simply controlling via the Internet with a web-based SDR application. Instead of the audio going through a sound card into your headphones, it’s going into a soundcard, piped through the Internet, then into your headphones. Give it a try! 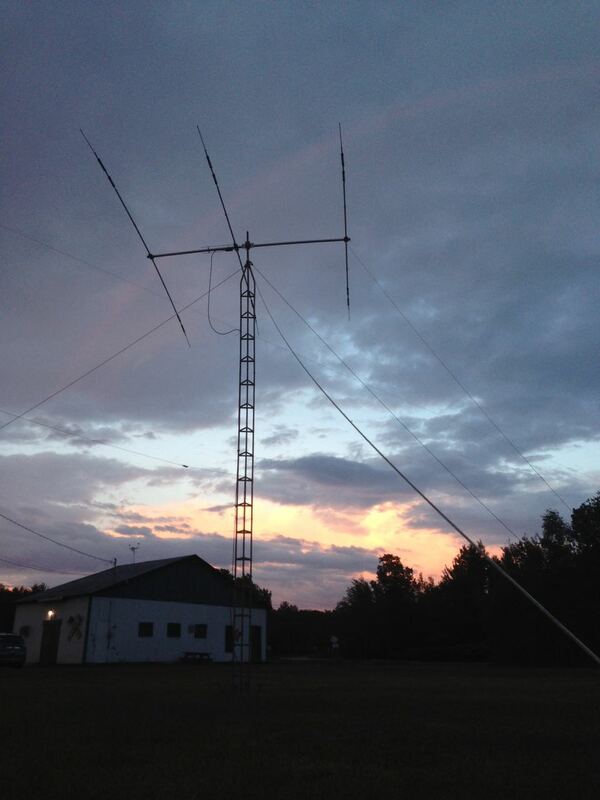 You might find an impromptu DXpedition is the perfect remedy to your QRM and RFI blues! Post readers: Any heavy KiwiSDR users out there? Or do you oppose using WebSDRs? What are your thoughts? Please comment! Do you enjoy the SWLing Post? Please consider supporting us via Patreon or our Coffee Fund! Your support makes articles like this one possible. Thank you! This entry was posted in DX, News, Radios, Shortwave Radio, Software Defined Radio and tagged DXpeditions, Field Radios, KiwiSDR, QRM, Quebec, Radio Frequency Interference, RF Noise, RFI on September 16, 2018 by Thomas. Yesterday, the weather was gorgeous here in Québec, thus a prime opportunity to find a beach, start a new book and, of course, play radio! 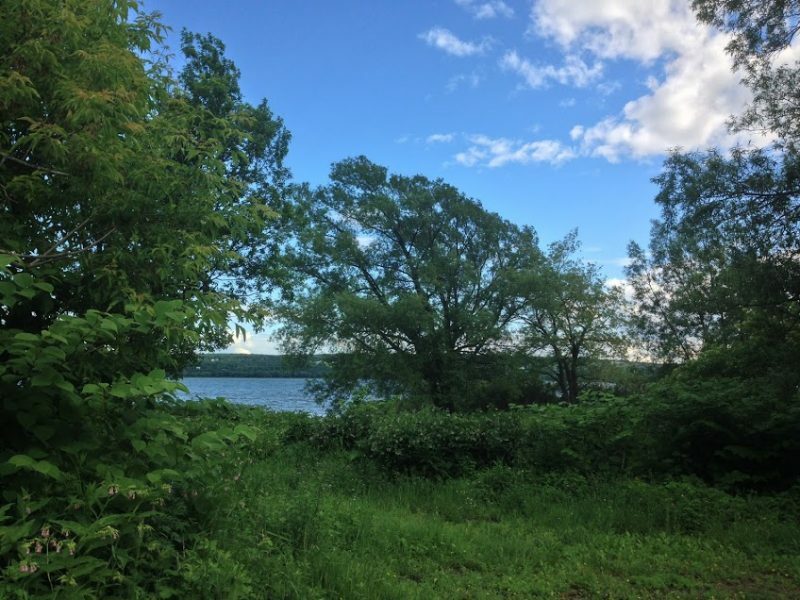 I found a fantastic spot on the north bank of the St. Lawrence river near Baie-St-Paul, Québec. There were only a few folks at the beach, so it was all very peaceful. I found a picnic table perched on the edge of the beach shaded by an apple tree–a perfect spot to relax, play radio and start a new book: Dark Voyage by Alan Furst. I brought two portables: the C. Crane CC Skywave SSB and the recently acquired Panasonic RF-B65. I had not checked to see if propagation was good, but tuning to WWV on 10 MHz and 15 MHz confirmed that signals were travelling. In fact, as I started tuning around–first with the CC Skywave SSB, then with the Panasonic RF-B65–I discovered some of the best propagation I’ve experienced in ages! I did a relatively quick scan covering the 31 through 19 meter bands. Some signals were absolutely booming in. I jotted down some of the broadcast details on a make-shift log and recorded a few videos. Click here to view on YouTube. All in all it was a brilliant afternoon and the short band scan reminded me that there is still so much content to be found on the shortwaves. You just need a little propagation, and some time to listen and explore! Post readers: Have you snagged any elusive DX recently? Please comment! This entry was posted in DX, News, Portable Radio, Radios, Shortwave Radio, What's On Shortwave and tagged C.Crane CC Skywave SSB, CC Skywave SSB, Field Radios, Field Recordings, Panasonic, Panasonic RF-B65, Quebec, RF-B65, Shortwave Field Recording, Shortwave Radio on September 7, 2018 by Thomas. Give Your Radios a Vacation! In 2013, I wrote the following feature for the Monitoring Times Magazine. Looking back, I realize that I never posted this article on the SWLing Post. Since we’re in the midst of the summer travel season here in the northern hemisphere, I thought I’d post this feature from five years ago. I’m also adding a number of photos I took at the Radio Canada International Sackville, New Brunswick, transmitting site–one of my stops on this trip. I only recently rediscovered these (400+) photos in my archive and I’ve yet to curate them and post a proper photo tour. Look for that in the coming months. Phare De La Pointe À La Renommée (Marconi Station, Museum and Lighthouse, Quebec, Canada. If you’re like me, a vacation–or, for that matter, any kind of travel–is an excellent reason to pack up your radio gear. I nearly always travel with a shortwave radio, and typically with some portable recording equipment. 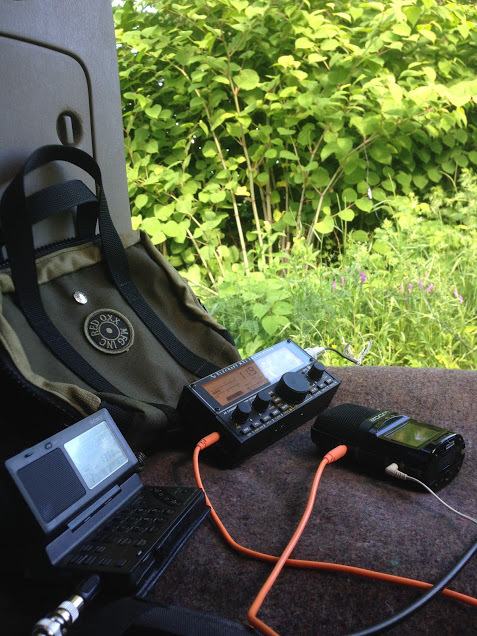 If space allows, I also pack a small QRP transceiver–specifically, my Elecraft KX1–even if I know my opportunities to get on the air may be limited. But on an extended family vacation? Well, that affords some excellent hamcation possibilities! Last year , our family had a golden opportunity: to spend an entire month in an off-grid cabin on the eastern coast of Prince Edward Island, Canada, some 2,500 miles from our home in the US. Permit me to paint a picture of this little spot of paradise: the rustic cabin is nestled on a 22-acre site on a beautiful eastern bay. From the cabin’s large front windows facing the bay, there is a long-range view of Panmure Island and, further still, of the Georgetown marina. The view from our off-grid cabin on Prince Edward Island. As the site is wooded to the rear of the cabin, the environ feels very isolated from the rest of the world; no other homes or outbuildings are visible. And although off-grid, this little cabin sports simple versions of all of the comforts of home: propane gas meant that we always had hot water, a working refrigerator/freezer, and light after sunset in the form of two wall-mounted gas lanterns. Meanwhile, running water was provided by a unique “on demand” petroleum-powered pump. While to some readers, this may not sound like paradise, this charming cabin gave our family a front-row view of nature’s varied character, from the shimmering sunsets over PEI’s famed terra cotta sands or the last stormy lashes of Hurricane Debbie, to the front-yard wildlife in the form of woodpeckers, owls, gulls, egrets, foxes, mink, and even “Black-Eyed Susan,” our resident raccoon. “Off-grid,” meanwhile, afforded all of us a refreshing break from those electronic devices we often become so –with the exception of radios, of course! On the return route, we planned to take a driving tour of the Gaspe region of Quebec, via the New Brunswick Acadian coastline. Having made the decision to spend four weeks in the little cabin, I instantly started preparing my radio equipment. As you can imagine, an isolated off-grid cabin poses some serious power-supply challenges for a radio hobbyist, but the benefit is a completely RFI-free zone. In truth, not only was I ready for the challenge, I was enthusiastic about it! It’s worth noting that on most days of the week, I wear two hats: that of radio hobbyist and that of radio-based humanitarian organization director, Ears To Our World (ETOW). At ETOW, we work in classrooms located in very remote, rural and impoverished parts of the world, delivering appropriate support technologies, such as radios, to those who need them most. While in the isolated setting, I charged myself with the task of testing some of our solar and self-powered technologies–specifically, a portable power pack made by GoalZero called the Escape 150, and several portable panels and chargers made by the US manufacturer, PowerFilm Solar. Living in an off-grid cabin for a month would give me the necessary time to evaluate the charge/discharge times and simulate the “real life” usage these items would experience in the developing world. Fortunately as a radio hobbyist, I had the means to put that powerpack to the test! My two radio-inspired passions combined harmoniously in this venture. All told, all the radio equipment and power supplies I packed consumed no more space in our van than two standard suitcases. Even after packing, we found we had room to spare–the children in their carseats had plenty of room to swing their feet. So, we set our compass on due north, and set out! En route to Prince Edward Island, it’s hard to miss the (now) former Radio Canada International transmission site in Sackville, New Brunswick. The massive site, with its array of curtain antennas and large sign, is a fixture on the Trans-Canada Highway. Only a few months earlier, I had learned that RCI had been dealt devastating cuts by the CBC and that Sackville’s days were numbered; as a result, I felt I had to make a pilgrimage to the site before it was dismantled. I arranged to tour the site, and was warmly greeted in Sackville. Though the staff were dealing with the oppressive news of the pending cuts, were bravely doing their professional best to carry out their duties as usual. The site was immaculate, the transmitters humming. On my tour, I took as many photos as my digital camera would hold, and soon I found myself taking up the cause, mentally working out an action plan to save it from total dismantlement. For many years, this site has been a landmark near the New Brunswick/Nova Scotia provincial line, and I hope in some capacity it will remain there, even for history’s sake. This relatively remote part of Canada has broadcast memorable events and news to every corner of our globe. It seemed a shame to undo the work of so many previous years. And indeed, the petition I authored this fall has garnered over 600 signatures, so it is clear there are many that feel the same. The decision is now in the hands of politicians. Many, many thanks to my amazing tour guide, Marcel Cantin, who gave me unfettered access to the RCI Sackville site. Merci bien, Marcel! After leaving Sackville for Nova Scotia, we took the Wood Islands ferry across the Northumberland Strait and arrived at our cabin well before dinner time. The morning after arriving at our little off-grid cabin, I sprayed myself down with a little insect repellent and spent an hour installing an inverted vee. I’ve found that, instead of pre-building an antenna, it’s easier for me to conduct a site assessment and simply put the pieces together in a configuration that makes sense. That’s the great thing about temporary QRP antennas: no soldering required. I simply fed my antenna with ladder line, used a PVC “T” joint as a center insulator and large plastic buttons for the insulators at the end of the legs of my antenna. I held the whole thing together with wire nuts and black electrical tape. Yet because it was electrically sound and balanced, it worked like a charm. Indeed, I didn’t even worry about the length of the radiating elements since I had my Elecraft T1 auto antenna tuner on hand. That Sunday morning, I set up my entire ham radio and shortwave listening station all before my family was ready to venture out for the day. That afternoon, I worked stations in the US, Canada, and many of the islands in the Caribbean. I was delighted, to say the least. 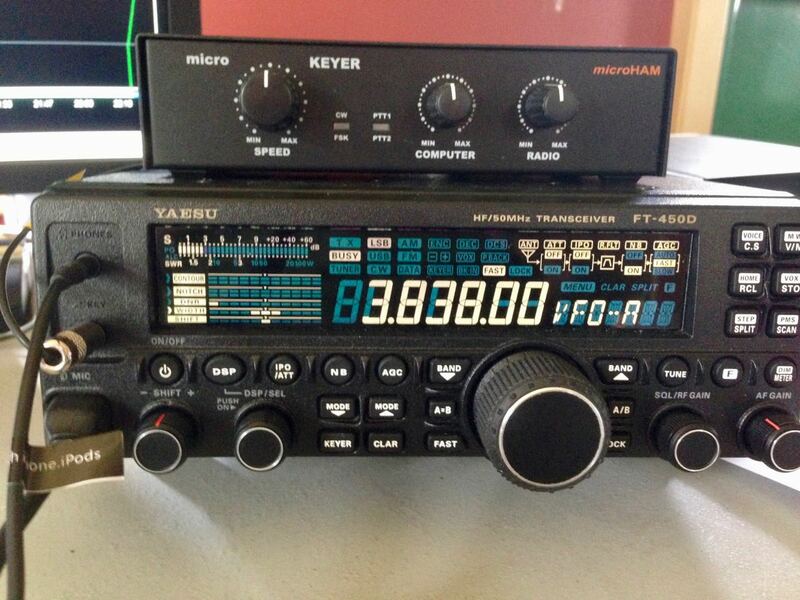 My Elecraft K2 and Elecraft T1 combination was working beautifully on all bands down to 80 meters. I found that, even with heavy use, the K2 required very little of my 30 aH battery. Each day, I charged the battery with two of my foldable 5 watt PowerFilm Solar panels fed in parallel (equating to 10 watts). I never ran out of power for the K2 and had enough surplus to easily power some 12V LED lanterns, as well. I was most impressed with the performance of my solar-powered Elecraft K2–no doubt, the very close proximity of salt water (perhaps 200 feet from the antenna) and the height of my inverted vee both helped. Though I worked some CW, I made more SSB contacts than I typically make while portable. I even found that I punched through a couple of pile-ups. Some kind operators also noted me on DX watch lists, and I found myself on the other end of mini pile-ups. 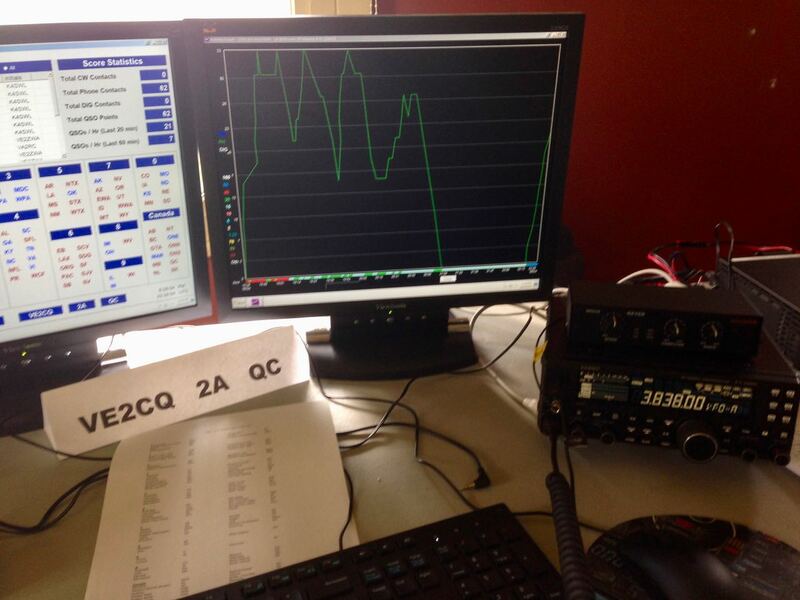 Most encouraging were the numbers of other QRP stations I worked, even on SSB. In short, I was having a great time…! I brought four receivers with me on this trip, the plan being to compare their reception: a Winradio Excalibur, Bonito RadioJet, Sony ICF-7600GR, and a Tecsun PL-380. Shortwave radio listening in this coastal spot was nothing short of amazing. In my band-scanning, I heard many of the international stations audible from my southern-US home, like Voice of Greece, All India Radio, Radio France International, the BBC World Service, and Radio Australia. Listening to the final broadcast of Radio Netherlands on Prince Edward Island. Though I planned to do some serious 2 MHz spectrum captures on my WinRadio Excalibur, I had not taken one thing into account: the amount of noise that the built-in modified sine wave inverter on the GoalZero Escape 150 generated. It overwhelmed the Excalibur and rendered listening useless. I could have easily remedied this, had I realized that the input on the WinRadio receiver required a steady 12VDC–I could have used an appropriate battery and never bothered with the inverter. The RadioJet, meanwhile, performed quite well, though my laptop’s battery had a hard time supporting itself and the receiver for more than an hour without the need of a total recharge. While the GoalZero Escape 150 power pack performed very well with DC usage, the inverter could drain a full charge in less than two hours of use. 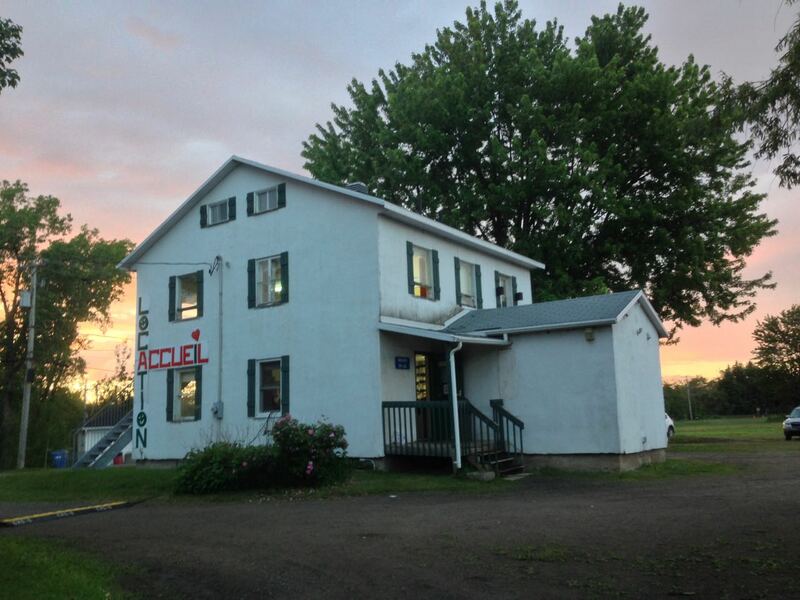 Any given morning during that vacation, you would find me lounging in front of the cabin’s large glass windows–often watching the sunrise–and listening to CKZN in St. John’s, Newfoundland, on 6,160 kHz–a CBC Radio One shortwave relay in Newfoundland. Though I can hear CKZN back home when conditions are just right, it’s faint. On PEI, however, it was armchair listening as I sipped my morning java. What’s more, I even got to relive a little radio history in our travels. On PEI we visited the Marconi Station at the Cape Bear Lighthouse. According to lighthouse staff, this little station was one of the first (they will claim, the first) to receive the distress call from the Titanic. On the final leg of our trip, we visited another Marconi Station at a breathtakingly beautiful lighthouse–Pointe-à-la-Renommée–where it stands on a bluff overlooking the mouth of the St. Lawrence on the very northeastern tip of Quebec’s Gaspé peninsula. This station, sited by Marconi in 1904, has many historic displays with original photographs spanning the decades, copy from messages sent and received, and a guided history of the station. Pointe-à-la-Renommée also features a very respectable collection of telegraph keys and Marconi console receivers. But the red lighthouse itself is the real show-stopper, with its gorgeously-faceted crystal above a charming lighthouse keeper’s house and cluster of outbuildings, on the green wind-swept bluff dotted with wild strawberries, and surrounded by the dark blue Atlantic waters far below. Field Day coincided with our summer vacation, too, and I hated to miss hanging out with my local ham buddies on my favorite event day of the year. 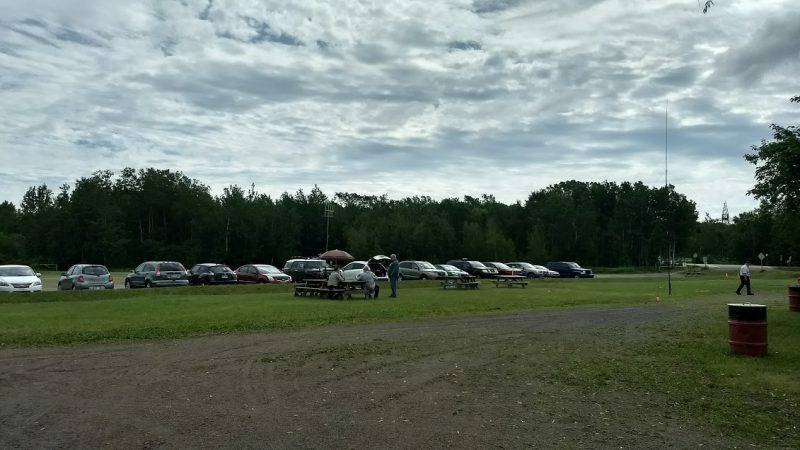 I decided to attempt to turn this relative misfortune into an opportunity: before we left on vacation, I did a bit of research and learned that there would be a Field Day event near Charlottetown, PEI. After a few inquiring emails, I discovered that this Field Day site was only twenty minutes from where we were staying. The stars had clearly aligned. 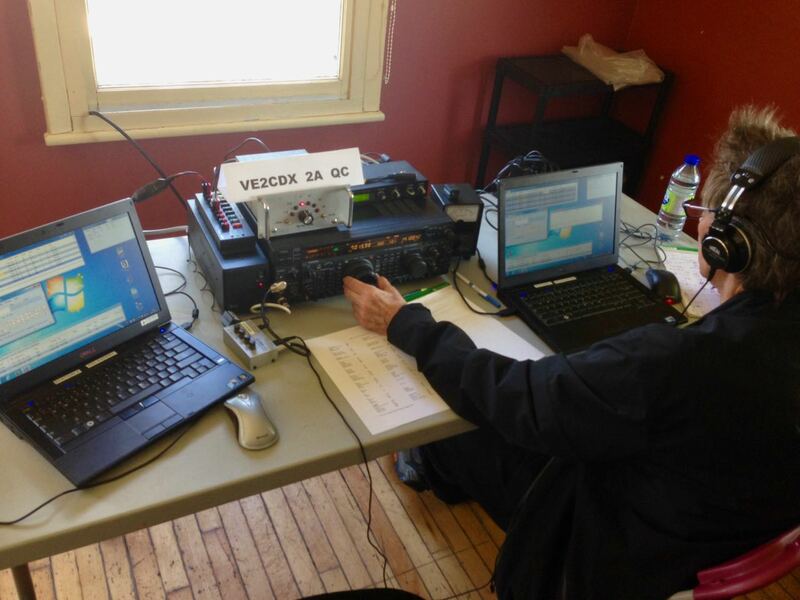 One of the Charlottetown Amateur Radio Club members working SSB contacts. 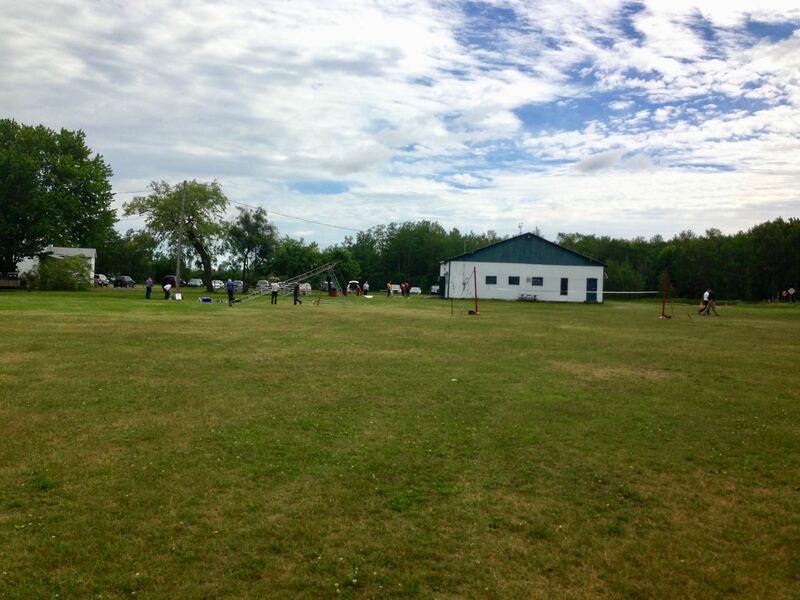 On Field Day, I was greeted most warmly by the good folks at the Charlottetown ARC. They instantly took me in as one of their own–offering food and drink, and chatting with me as if I had always been a part of their club. Best of all, when Field Day officially began, they put me on the mic on 20 meters. Evidently, they decided it would be fun to hear me announcing their callsign on the air in my southern accent. They got what they asked for! 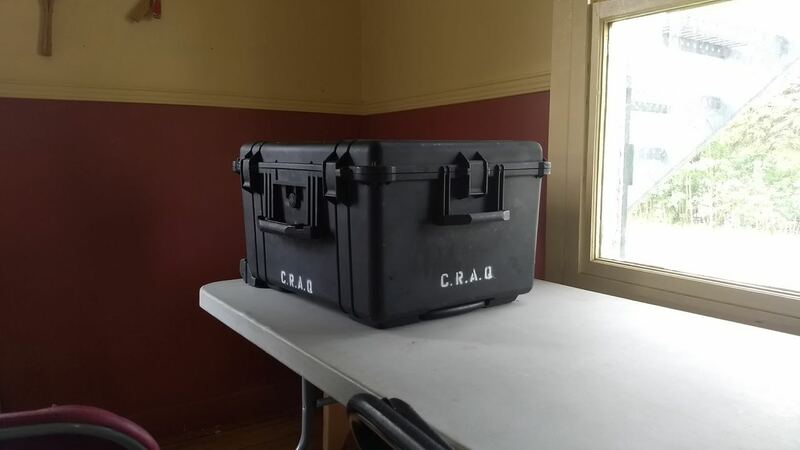 From the moment I took the mic, I had almost an instant pile-up; not because of my accent, however, but because Charlottetown offered one of the few stations on PEI, and the opportunity for participants to log the Maritime section. It was a wonderful Field Day, after all. Both the family vacation and my personal “hamcation” were a treat, and I’m ready to do this all again in the near future. Having such an extended stay made all of the difference, as I didn’t have to squeeze radio in, nor was it in competition with our other plans. Rather, radio became the thing I turned to when we were relaxing in the cabin, when my kids were drawing or playing, and my wife painting or reading–during our laid-back interludes between exploratory outings and adventures. I did learn a few things about playing radio completely off-grid. First of all, my QRP field events (like Field Day, FYBO, FOBB, etc.) had me totally prepped for off-grid ham radio. In fact I didn’t forget a single connector, battery, tool or accessory. 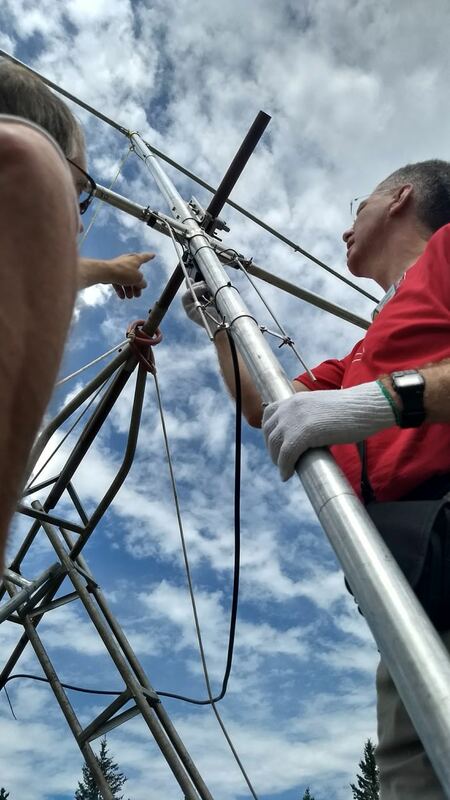 Setting up my outdoor wire antenna was a simple matter and I had fun on the bands, even though propagation wasn’t always perfect. What did surprise me was the number of times I turned to my portable shortwave radios over my PC-controlled receivers. Simply put, a good portable radio connected to a random length wire antenna gave the right amount of performance vs. battery consumption. Though the SDRs performed better when hooked up to my inverted vee, they used quite a lot of battery resources since both my laptop and the receiver had to be powered. If I could go back in time, I would have left the Excalibur at home, brought a general coverage portable transceiver and/or a dedicated tabletop receiver like my Alinco DX-R8. Capturing spectrum on a very RF quiet island location is very appealing, though. 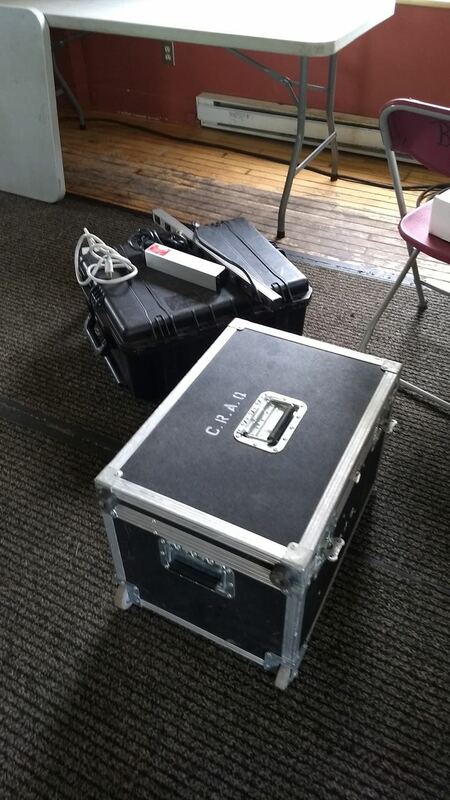 To make it work, it would require that I bring a separate 12VDC power supply and spare laptop batteries. With a modest PV system to recharge the batteries, it would also require constant planning–deciding when and where to listen, in order to recharge. Most of all, I discovered that no matter where you go, as a ham radio operator, you will find others in your fraternity that will take you in. 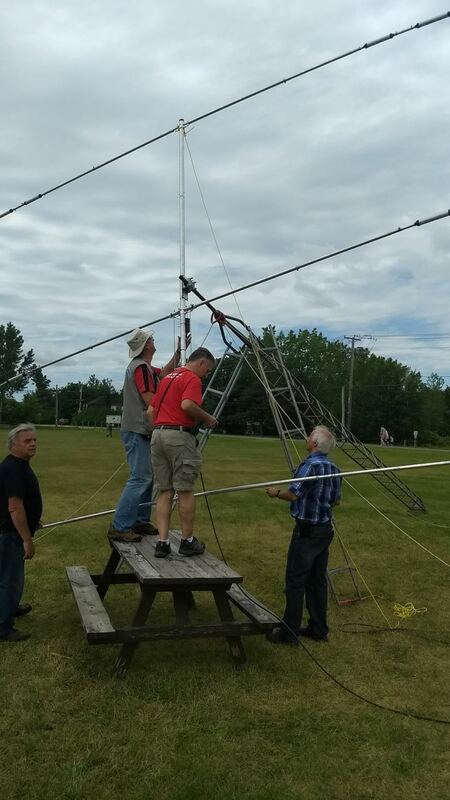 Field Day is one of my favorite days of the year and spending it with the good folks of the Charlottetown PEI Radio Club made it all the better. Not only did they get a kick out of hearing a southern accent announce their station on the air, but I got a kick out of being on the other end of Field Day pile-ups. Hamcations don’t have to be month-long ventures, however. Even squeezing a little radio time in can be fun. A portable shortwave radio tucked into your suitcase on an extended business trip or a portable QRP transceiver on a week at the beach can add to your holiday fun–and if you’re lucky, create a few memories, and possibly even friends. Again, I’d love for readers to share their upcoming travel and radio plans. Please comment! This entry was posted in Broadcasters, Ham Radio, International Broadcasting, News, Photos, Radio History, Radios, Shortwave Radio, Travel and tagged Hamcation, Marconi Stations, PEI, Pointe-à-la-Renommée, Prince Edward Island, Quebec, Radio Canada International Sackville New Brunswick, Radio Netherlands, Shortwave Travel, Travel, Travel Shortwave, Vacation on June 24, 2018 by Thomas. 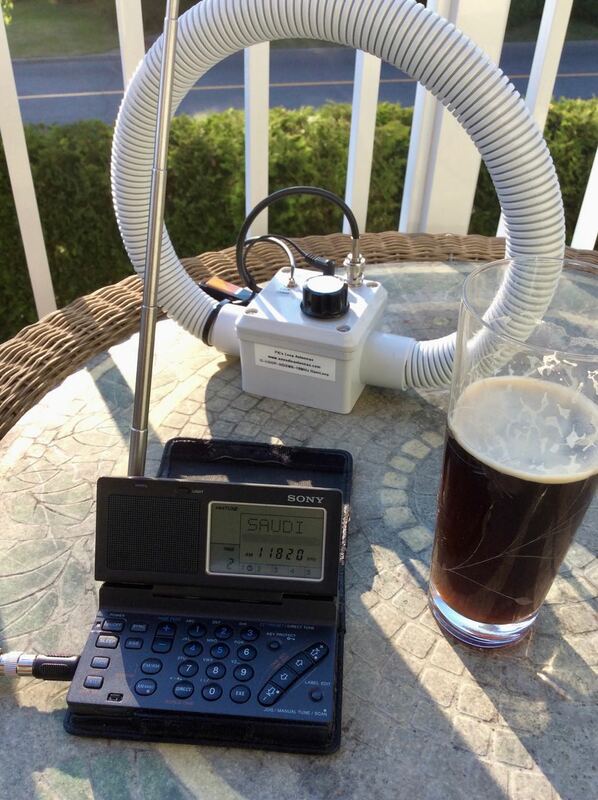 A Sony SW100, a PK Loop, and a pint of L’Écurieux brown ale. Lovely trio! If you’re a regular Post reader, you’re probably aware that I enjoy a relatively RFI-free environment at my rural mountain home. RFI-free living is something of a luxury, even though our rural location also equates to appallingly slow Internet service. But unfortunately, when I travel, I usually find that I’ve traded my RFI-free atmosphere for the chaos of noise-ridden bands. If you’ve ever stayed at a modern hotel and tried to tune to anything on mediumwave or shortwave, you’ll know just what I mean. We’ve spent this summer, like last, near Québec City, Canada. Near this fairly large city, I’ve been greeted by more than enough RFI to make up for the lack of RFI most of the year. I attribute the atrocious RFI to the number of light dimmers the developers put in this condo complex and the proximity to a field of noisy electrical poles. Of course, all of the unregulated power supplies in the area don’t help, either. It’s a jungle of noise. Last year, I purchased a PK Loop portable HF loop antenna (about $150 on eBay)–specifically with hotels and this very condo in mind. I must say, it has been a welcome travel companion on this trip. While the PK Loop seems to pair well with my Sony SW100, I also love using it with my Elecraft KX2 for SWLing. 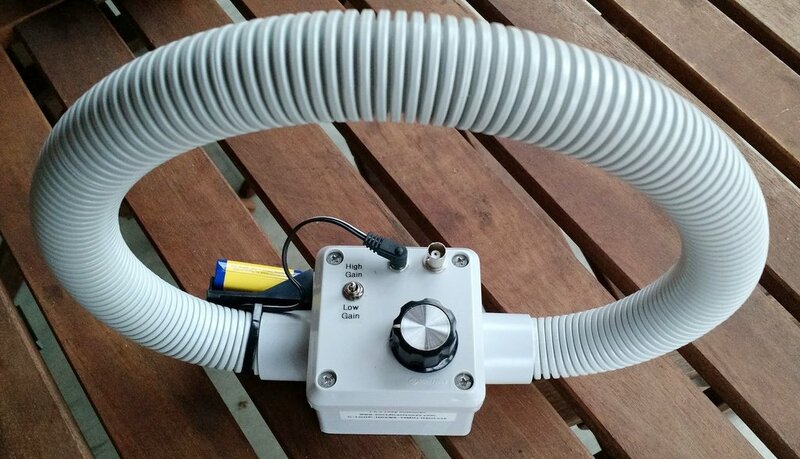 Sadly, the PK Loop doesn’t provide the noise mitigation of a large wideband mag loop antenna–like a Wellbrook or Pixel Loop–but it does lend itself to excellent portability and takes the edge off the noise. While it’s easy to do my radio listening in the condo from a comfy chair, in reality, it limits what I can receive in a serious way. The 31 meter band, for example, is so heavily submerged in RFI that only the strongest stations can punch through (for example, Voice of Greece, Radio Romania International, WRMI, WBCQ, Radio Havana Cuba, China Radio International). So, what can I do? Hit the field, of course! That’s right. Taking a page from the books of SWLing Post contributors London Shortwave and Clint Gouveia, I realize I can simply leave the RFI behind and seek a sound, radio quiet spot for SWLing/DXing! 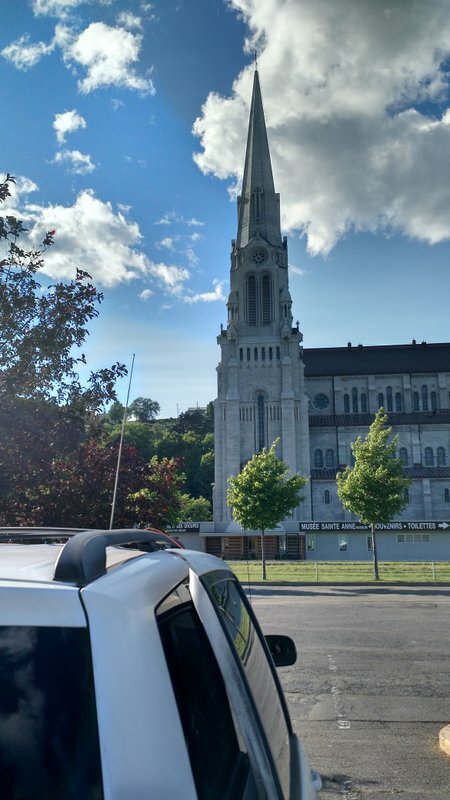 My listening post last year–during the BBC Midwinter broadcast–in the parking lot of St-Anne-de-Beaupré basilica. Over the past two months, I’ve taken time to escape the RFI and do a few live listening sessions and spectrum recordings in the field. I’ve always got my SDRplay RSP, Elecraft KX2, and Sony ICG-SW100 at the ready. 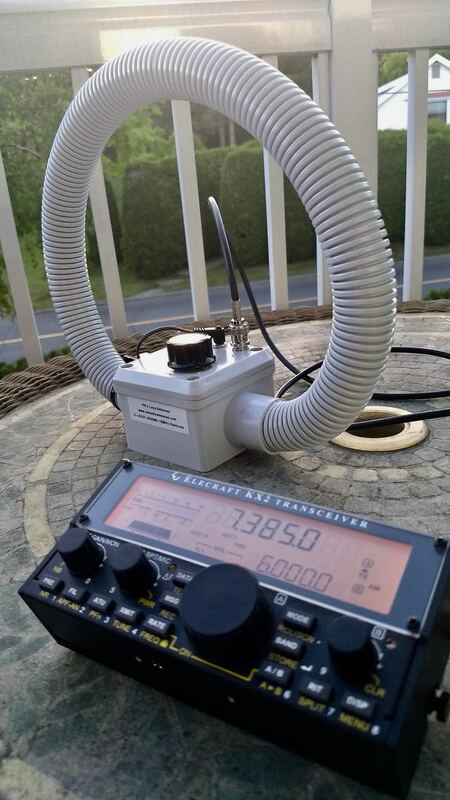 In terms of wire antennas, I’ve deployed my NASA PA30 and even my QRP Trail-Friendly EFT, with good results. Listening to the 2017 BBC Antarctic Midwinter Broadcast from the back of my vehicle in Saint-Anne-de-Beaupré, Québec, Canada. I’ve also been experimenting with the homebrew Miniwhip antenna that SWLing Post contributor, Steve Yothment, provided earlier this year, based on the design used by the U Twente WebSDR. As Guy Atkins recently demonstrated, miniwhip designs do require some distance from sources of RFI, however. Just a friendly reminder that if you live in an RFI-dense environment, you can certainly design a system to help mitigate RFI at home. After all, home is where you likely spend the bulk of your free time. View of the Saint Lawrence River from my back-of-the-minivan listening post. But, again, the easiest way to substantially increase your chances of snagging DX stations is to simply hit the field. Join me in giving it a try. Find an RFI-free location with access to a couple of trees to hang a simple wire antenna–say, in a park, at the side of a rural road, on a friend’s farm…and if you find the listening good, make it your radio get-away. You’ll likely find that your portable shortwave radio can outperform your at-home tabletop receiver simply by removing yourself and your radio from the noisy environ of indoors. 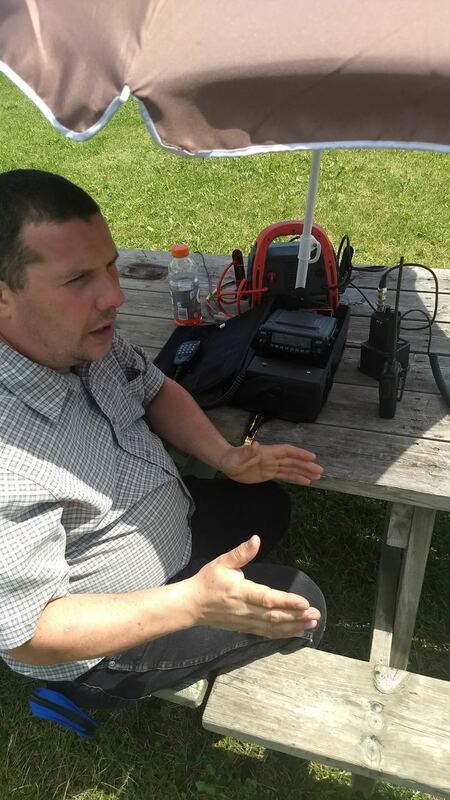 When you first start doing radio in the field, it might feel a bit awkward–especially if you’re taking more than a portable shortwave along for the ride–but you’ll soon enjoy the fresh air ambiance and maybe even prefer it to indoors. Even if you’re in a public setting where curious passers-by may want to know what you’re doing, as they undoubtedly will…When questions arise, take a (brief!) moment to educate your questioner(s) about the fascinating and nearly-forgotten world of shortwave radio––maybe you’ll inspire others to listen in, too. And trust me: once you’ve been to the field a few times, you’ll start to look forward to playing radio in the great–and noise-free–outdoors! 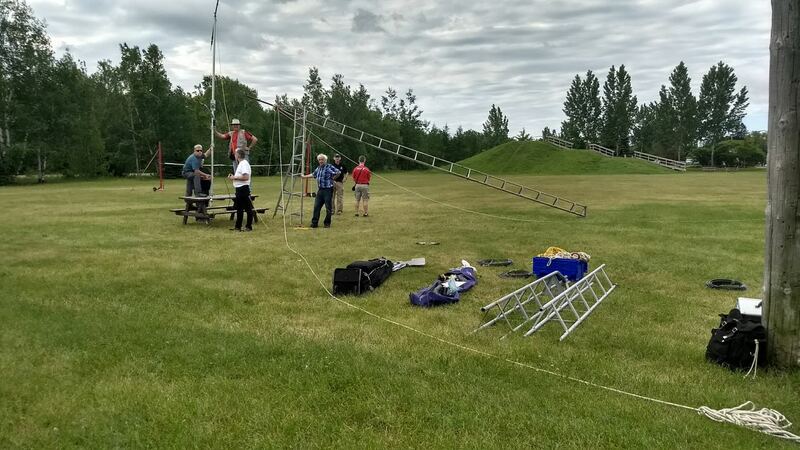 This entry was posted in Ham Radio, How To, News, Portable Radio, Radios, Shortwave Radio and tagged Elecraft KX2, PK Loop, PK Loop C-LOOP-HDSW6-18, Quebec, Sainte-Anne-de-Beaupré, Sony ICF-SW100 on August 7, 2017 by Thomas. 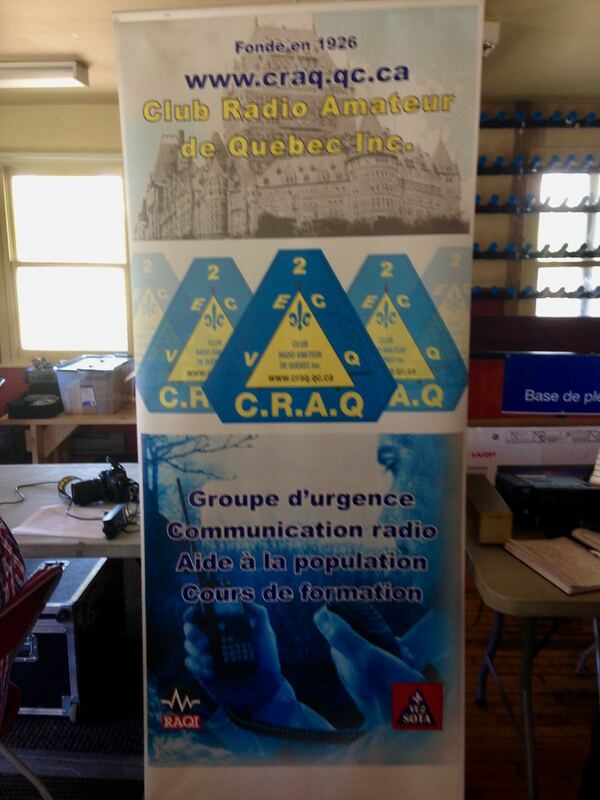 For the second year in a row, I had the pleasure of hanging out with the Club Radio Amateur de Québec (C.R.A.Q.) on Field Day. Members number well over 150 and the club has a history dating back to 1926. 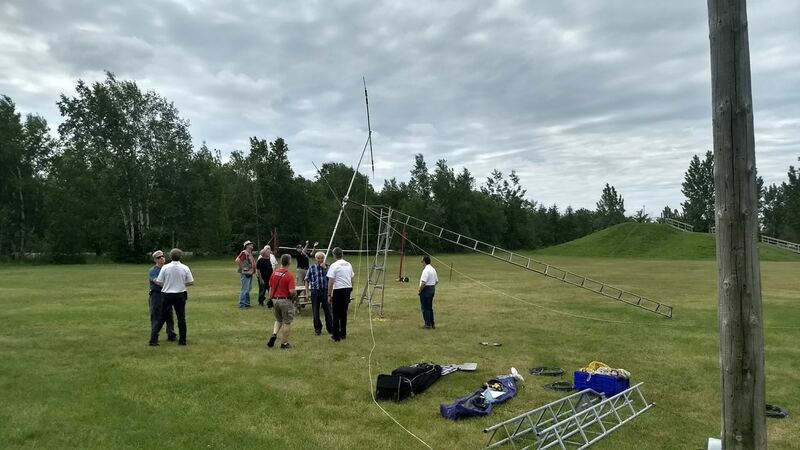 Last year, I found myself in Québec during my favorite on-air event, so I reached out to the club’s Field Day organizer and found myself welcomed with open arms; I was especially honored to discover that the group even reserved a time slot at the radio for me. When I reached the site Saturday morning (June 24), I felt like I was coming back to a radio reunion. 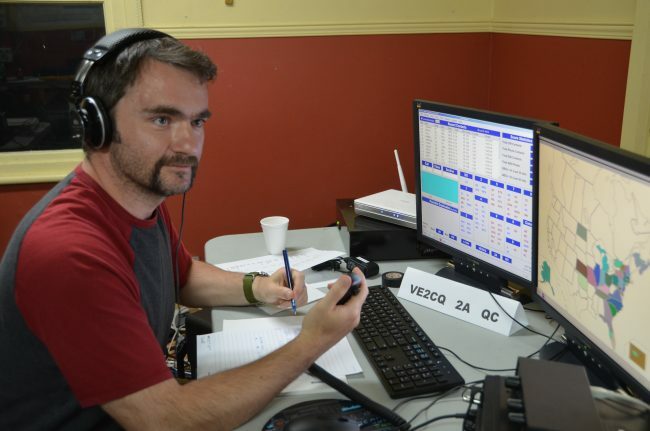 The folks at the club were incredibly hospitable, and once again, I enjoyed operating as VE2CQ. Shortly before my radio shift ended at 20:00, Sébastien Le Galle (VA2SLW) sat down with me to listen as I worked stations across the band. As I was about to hang up the microphone, instead, I offered it to him. Sébastien, I learned, is a newly-minted ham and, turns out, had never made contact on the radio. I encouraged him to take the mic, which he did without hesitation. 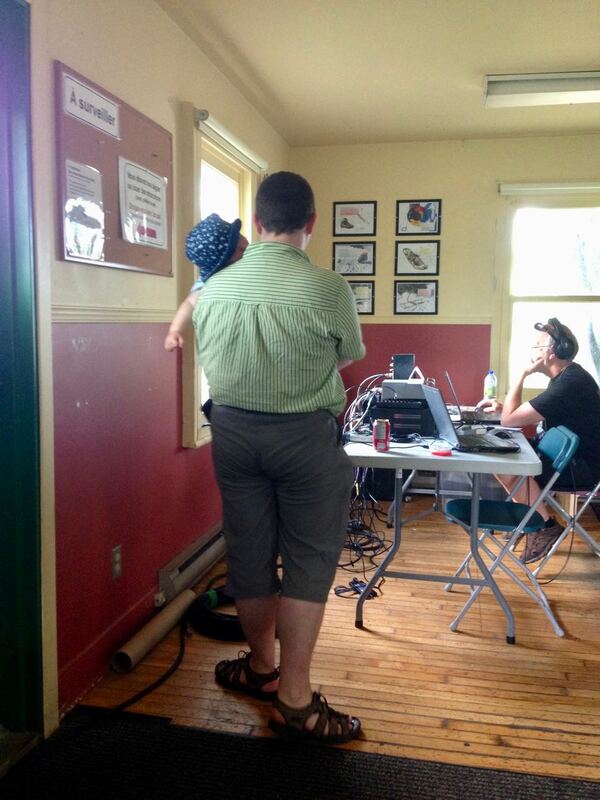 After a very brief intro on the Field Day exchange, Sébastien worked two stations in succession. Moreover, as I learned the next day, he worked an additional four stations after I left the site. Bravo, Sébastien! And welcome! As I finally left the site around 20:45 (local), I snapped a few photos of the Field Day house and antennas at the Base de plein air de Sainte-Foy. A beautiful evening at a great site––and a fine finish to a thoroughly enjoyable Field Day, once again. 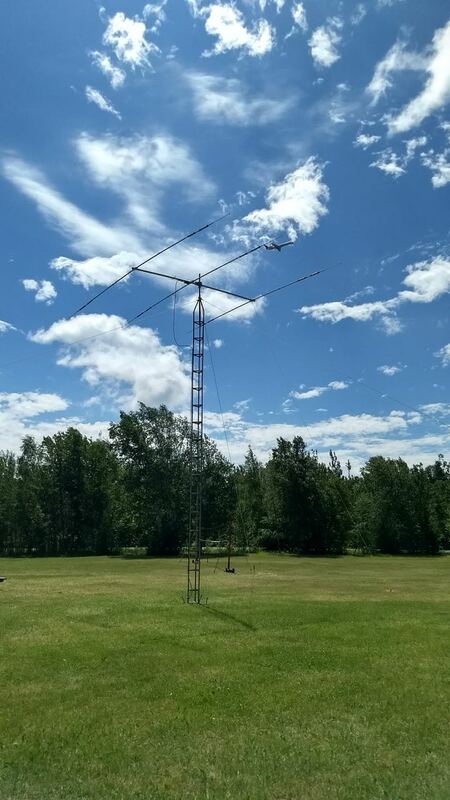 This entry was posted in Ham Radio, News, Radios, Shortwave Radio and tagged C.R.A.Q., Club Radio Amateur de Québec, Field Day, Field Day 2017, Ham Radio, Quebec, Yaesu FT-450 on July 1, 2017 by Thomas. Wes on Can you identify this radio from the 1992 film, ‘Sneakers’–?